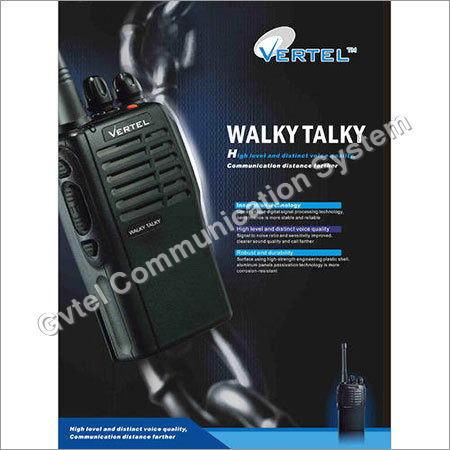 This Vertel Walkie Talkie is a professional digital transceiver, high in demand for remote site connectivity and intra- building coverage in malls and hotels. This is an affordable, high quality device, best known for offering a wide range of features to meet your daily communication needs. Vertel Walkie Talkie gives you clear and crisp voice quality and is interoperable with analog radios. In addition, it also has an integrated large true color display with in- built clock, alarm, calendar and calculator. While switching to another channel, the user can hear the voice annunciation current channel number. The annunciation could be programmed in different languages. Auto Power-saving provides longer transmission and stand-by time. 10 seconds after no signal or operation, the auto power-saving is activated to minimize power consumption. It resumes to normal mode while receive signals or being operated. When the Time Out Timer is enabled, the radio will prevent the user from continually keying the radio and avoid interference with the majority of the users. 5, Busy Channel Lockout This feature is used to prevent interference with on-going conversations. If the Busy Channel Lockout feature is enabled, the radio will remain in the receiving mode even if the PTT is pressed to avoid interfering with other conversations. Standard 38 tones for CTCSS and standard 83 codes for DCS are available (PC programmable). Powerful CTCSSIDCS Encoder/Decoder can prevent co-channel interference and unwanted conversations on the same frequencies and ensure smooth communication. Squelch reduces background noise and improves sound quality squelch level adjustable by PC software makes the radio can be widely used in various environments. To quickly set the parameters on a radio. the radio data can be cloned from one radio to another with a cloning cable. This allows the quick programming of the radios without a PC. This feature allows the operator to override the squelch settings and hear a very weak signal. This feature prevents unauthorized persons from reading or writing the parameters stored in the radio. This prevents the casual user who has your radio Iron reading sensitive information such as frequencies. CTCSS tones or DCS codes.